On November 11, 1918, the war in Europe officially ended with the signing of the armistice. 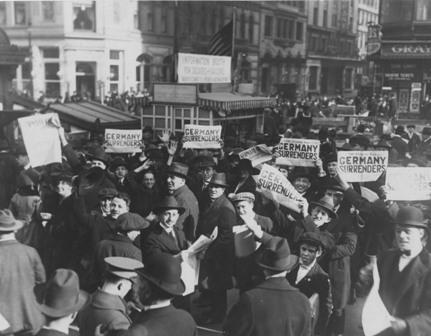 The American Expeditionary Force was in the midst of transitioning into an army of occupation, while those at home began preparing for their boys’ return. Parades, masses of thanksgiving, and other celebrations were planned for their arrival. However, the joys of homecoming also came with sadness. Over 116,000 American men, with more than 13,000 were from New York State alone, would not be returning home to their loved ones. Questions soon arose as to how the war should be remembered and how the dead should be commemorated. In many ways, some parishes in the Archdiocese had already begun to preserve the memory of the Great War while it was still going on. Our Lady of Lourdes in Manhattan, for example, published the letters they received from their men overseas and in training camps in their monthly parish publication. Many other parishes hung service flags from their windows, updating the number of stars as more men joined the military or changing the color of the stars as men died. Information was collected to keep track of who was fighting overseas in order to maintain an accurate picture of the war for the families back home. 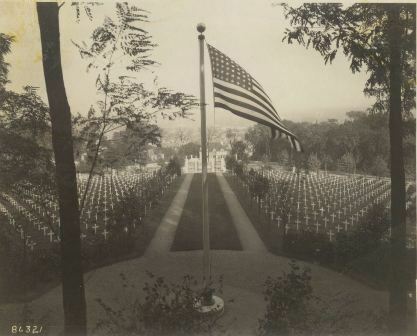 The collective memory, or rather the particular way in which a group remembers certain events, of the First World War varies from place to place throughout the United States. This is best seen by the memorials that began to appear at the war ended and the years after. These memorials or monuments depicted heroism as well as sadness, depending on the effect of the war on the particular community. Memorials, both small and large, became places for families who lost loved ones to grieve as well as honor the memory of their fallen sons. To many, the creation of memorials was seen as a civic duty, a way to contribute to the preservation of memory of those who sacrificed their lives for the greater good. Many memorials depicted a typical image of a soldier, the doughboy, while others were unique works of art. Ceremonies were held into the 1920s as communities raised money to erect monuments to remember the war. On a national level, the Tomb of the Unknown Soldier was officially dedicated in 1921 on the anniversary of the signing of the Armistice. This memorial acted as the unofficial national World War I monument until the remains of an unknown soldier from World War II were added. Today, a plan is finally in the works for the creation of a national World War I monument in Washington DC.